Steven A. Camarota is the Director of Research and Ashley M. Webster is a demographer at the Center for Immigration Studies. Some commentators have argued that the failure of Congress to pass “comprehensive immigration reform,” coupled with Arizona’s new enforcement efforts, will increase Hispanic turnout in the upcoming midterm elections. 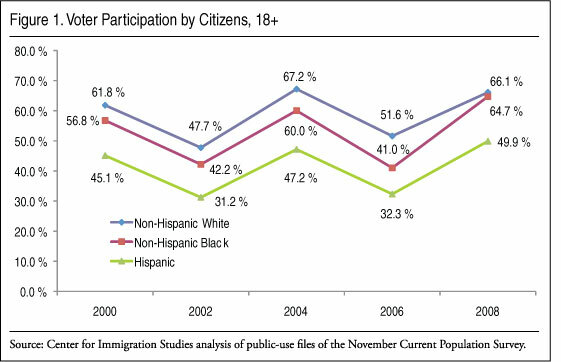 More recently, others have argued that these same issues will dampen Hispanic turnout. This Memorandum provides a means for evaluating these arguments by examining the Hispanic voting trends in past midterm elections and projecting what their turnout might be next week based on data from the Census Bureau. Once the election is over, the extent to which Hispanic turnout follows or deviates from past patterns can be used to evaluate if this was an unusual election with regard to Hispanics. 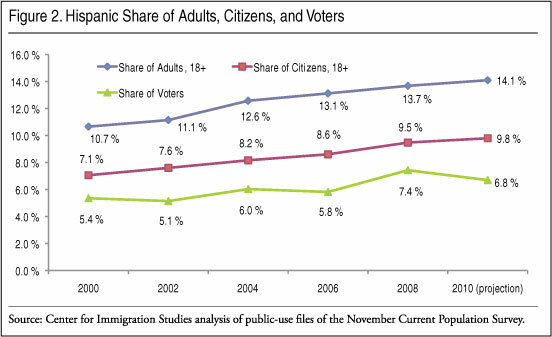 Only 28.2 percent of Hispanic voters in the 2008 election were immigrants (naturalized U.S. citizens). The Immigration Issue. The Pew Research Center for the People & the Press poll cited above found that Hispanic voters ranked immigration fifth in importance after education, jobs, healthcare, and the federal deficit. As Mark Lopez of the Hispanic Center points out: “Immigration does not rank as a top voting issue for Hispanics.”8 A Zogby poll from February of this year found that when asked if they favored enforcement and illegal immigrants going home or putting illegals on a path to citizenship, 52 percent of Hispanic likely voters favored enforcement, and just 32 percent favored citizenship.9 The fact that immigration is not a top issue for Hispanics and that pro-enforcement views are common defies the stereotypes of this population. This does not mean that immigration is completely unimportant to Hispanics. The Zogby poll found that Hispanics are more favorable toward amnesty for illegal immigrants than is the general public. What these results do mean is that other issues matter more than immigration and Hispanic views on the issue do not fit the stereotype often ascribed to them. 9 See “An Examination of Minority Voters’ Views on Immigration,” at http://www.cis.org/Minority-Views-Immigration.